The Model 1860 Light Cavalry Saber was the replacement for the Model 1840 Heavy Cavalry Saber. 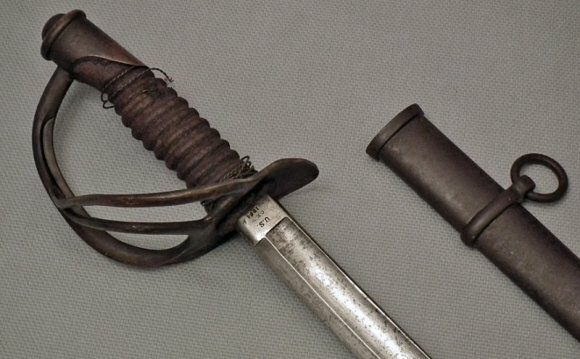 The Model 1840 Heavy Cavalry Saber was heavier and longer then the Model 1860 Light Cavalry Saber. The Model 1860 was the Saber of choice for mounted Riflemen, Dragoons, and the Cavalry on both sides. When J.E.B Stuart and George Armstrong Custer meet on the battlefield in Gettysburg both were carrying this Saber. Three version of the Saber were manufactured the Officers, Enlisted, and Ceremonial Sabers, the latter were privately purchased and normal had ornately engravings on the blade. The primary manufacture was the Ames Sword Company of Chelmsford Massachusetts. The Saber made its first appearance in 1859 with about 500 manufactured. The Saber was in use through the American Civil War, The Indians Wars, and made an appearance in the Spanish-American War. Today you can still see this Saber worn by U.S. Calvary Troopers during special events and ceremonies. Troopers may wear the saber if they have been awarded their Calvary Spur by completing a Spur Ride or being in Combat with a Calvary Unit. The author himself was awarded his Spurs in 1987 while assigned to the 4th Squadron 11th Armored Calvary Regiment, Fulda Germany. There are large amounts of the Model 1860 Light Cavalry Saber on the market today selling anywhere from $500.00 to $1000.00. I Just Found A Complete Civil War Cavalry Carbine!